The city of Glassholm has a unique relationship with the Moon. The man who founded and still rules the city is called the Lunane, colloquially the Moon King, and the city's mood and vitality wax and wane with the phases of the Moon. When the Moon is full, its citizens are joyous and dance in the streets. When the Moon is new, they are depressed and fearful. The effect is not limited to the city's people: on "Darkday" glass shatters, food rots, and buildings decay as if the city itself were dying. But the Moon always returns, rotating in a tight circle around the city as it has since the seemingly immortal Lunane brought the Moon many generations in the past. As Neil Williamson's debut novel The Moon King opens, however, the city is uneasy. The fishermen find only crabs in their nets, astronomers can no longer predict eclipses, and crimes are being committed under a nearly full Moon that were once rare even on Darkday. Anton Dunn is an engineer who has experienced first professional and then personal catastrophe. It was bad enough that his unorthodox ideas about lunar energy have earned him exile from Glassholm's engineering guild, but when his fiancée Krista doesn't show up to their wedding, he drinks himself into oblivion. He wakes up with the expected fierce headache but something quite unexpected as well: he finds himself in the Lunane's palace. What's more, he is not a prisoner or even a guest. No, patient retainers inform him, he is and has always been the Lunane, the founder and ruler of the city. That means he needs to hear petitions, have his movements recorded by the palace biographer, and, oh yes, discover what ails Glassholm and do whatever is necessary to fix it. Even though what he really wants to do is find his missing fiancée and go back to his research, he can't possibly be allowed to leave the palace until the city's problems are solved. Although Anton is, as the book's title suggests, the story's central character, almost an equal amount of time is spent with two other viewpoint characters that give alternate perspectives on the city. The first is Lottie Blake, a young artist whose dalliance with a foreigner from the Moonless lands across the sea causes her to get caught up in the plans of both an underground antimonarchist movement and the Church of Women, a female supremacist cult that hopes to depose the Moon King so they can set up a Moon Queen. The third viewpoint character is John Mortlock, an amnesiac former police detective who is now working as the chief of the Lunane's palace guard. There's a serial killer who seems to be targeting figures from Mortlock's past, a past he has forgotten almost entirely after the accident that ended his police career. With the police increasingly occupied by unrest in the city, it's up to Mortlock to find the killer and maybe some of his lost memories along the way. As even these quick summaries imply, although The Moon King is accurately described by its publisher as a fantasy, it borrows tropes from many genres. When Lottie falls into the hands of the cult her story feels patterned after horror novels, John Mortlock is a noir antihero familiar from many novels and movies, and Anton's narrative frequently feels like science fiction. In fact, there are moments, some coming very late in the narrative, when the author seems as though he is about to sweep the curtain aside to reveal some clever but rationally understandable machinery has been generating the story's many strange phenomena. This moment never quite comes, however, and in the end we are left with an ending described in almost fairy tale terms and left to draw our own conclusions. The first conclusion most will draw is that The Moon King is wonderfully inventive and thought-provoking. The basic setup summarized above is only the foundation upon which Williamson piles ever more fantastic mysteries. There are monkeys who confer good and bad luck, fighting automatons shaped like crabs and ravens, whispering children made of seawater, and much more. Reading it I suspected (and had it confirmed by this 2006 interview) that Williamson spent many years on this novel, because it reads like the ideas from ten debut novels compressed into one. That probably sounds like a recipe for excess, but while the plot's pacing can be uneven it never spins out of control. Far from bloated, the novel is just a bit short by modern standards, long enough to keep its strangeness from being packed so dense as to completely overwhelm while still ending before it all becomes wearying. If there's anything wrong with jamming so many different ideas and concepts into one slender novel, it's that some of them end up feeling underdeveloped. For example, the disappearance of Anton's fiancée just before the start of the story is theoretically a major motivator for him, but it never feels as if he cares very deeply. His lack of genuine concern eventually becomes something of a plot point, but when this storyline, which should be a critical part of his character, gets resolved in literally two pages (pp. 216-7, to be precise), one can't help but conclude the author hasn't devoted enough space to developing this properly. For minor mysteries relating to side characters, it's understandable that there isn't much elaboration, but dealing so swiftly with matters central to the viewpoint characters comes at the cost of emotional depth. John Mortlock suffers a similar fate, for when the secrets of his past are finally revealed two pages before the end they come too late and too briefly to have the impact they deserve. Of the three viewpoint characters Lottie Blake is the most successfully drawn, perhaps because her problems are rooted in mundane concerns about escaping the orbit of one's parents, uncertainty about a new relationship, and discovering her place in the world. But Lottie is unfortunately the most passive of the three characters, moved from place to place by people or events outside her control. Perhaps Lottie's passivity says something about how women live in Glassholm, but perhaps not. Intriguing people, ideas, and situations continually present themselves in The Moon King but they just as soon are ushered off for the next interesting scene. The result is a book that is consistently thought-provoking but doesn't feel like it does a whole lot of thinking itself. There are a few themes developed to the degree one might expect, but despite this being a novel that in most respects is wildly imaginative and risk-taking, they can best be summed up in the word "safe." Unthinking conformity is bad, it seems, and attempts to subvert nature can only succeed for so long before balance is restored. Well, all right, but that's pretty meager stuff for a book that involves malicious anarchists and Orwellian bureaucrats, people who remove memories and others who read dreams, two men who lose parts of their identity in different ways, and a third who may be more of an idea than a man. All that stuff is there, but what to do with it is left to the reader to sort through. For example, one of the best developed of the side characters is a newspaper printer named Blackwood who is involved in the underground anti-Lunane movement. He's a wealthy, moderate liberal who wants to reform the system but slowly and in a way that preserves what he thinks is good about it. He doesn't approve of the violence advocated by impatient radicals, but he needs their help and must try to work with them while also working against them. He's a somewhat sympathetic figure, but he's not above manipulating Lottie and her foreigner friend if he thinks it will advance his cause. It's always good when a novel colors such a figure in shades of gray instead of making everyone either saints or villains, but having introduced such a figure it feels as though not enough is done with him. When order in the city decays, will he radicalize? Will he find he must choose between keeping his property and his ideals? These questions aren't answered because Blackwood disappears from the book right when matters are coming to a head. How does he feel about the role of women in his society? What does he think about his ancestors' treatment of the island's indigenous people? These questions aren't answered either because although both women's issues and colonial legacy feature in other sections, those are compartmentalized. This has a diminishing effect: knowing where Blackwood stands on, say, women's rights would tell us something new about Blackwood as well as about how women's rights are regarded by the liberals among the propertied class. Most readers probably won't find any of this much of an obstacle, though, and to adequately deal with every idea The Moon King introduces would have required the book to swell into the doorstop category, so perhaps there's room in fiction for breadth as well as depth. It's also important to note that typically when we speak of unanswered questions in a story, we refer to loose ends in the plot, and in that respect The Moon King is unusually good. There's no sequel-baiting here. It unambiguously concludes the conflicts that each of its three central characters face and resolves the setting's many mysteries, although in some cases the reader will have to be paying careful attention. 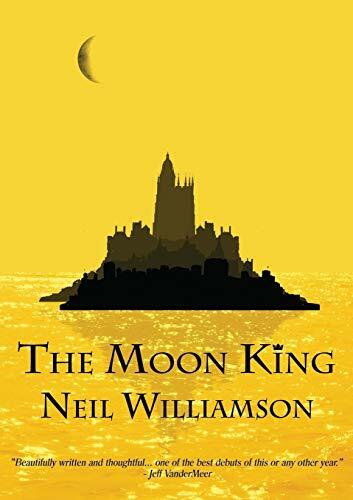 That, combined with its colorful setting and rush of ideas, places The Moon King in the top tier of fantasy debuts this year and makes Neil Williamson an author worth watching in the future. Matt Hilliard (matt.d.hilliard@gmail.com) works as a software engineer near Washington, D.C. He writes about science fiction and fantasy on his personal blog Yet There Are Statues.